I wish Barb and I had a great bunch of pictures of Spring Quilt Market to show you....but Barb and I stayed home this time. I worked in my yard over the weekend, knitted on my sock a bit, went to the movies and visited with my daughter and son. Everyone else was at the quilt party...and we were at home. I did feel a bit left out. No van to load up, no trip to drive, no antique booths to shop along the way, no booth to set up...and worst of all ....we didn't get to see the fun people we always see at market. (I'm starting to sound like I'm whining.) Really, there's quite bit of fun to be had in all of that work. Lots of inspiration too. I met with Barb over the weekend though. It's always nice to spend a moment with her. She gave me the May stockings to photograph. 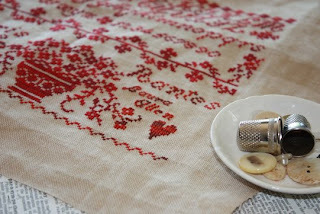 Today I've been working on photography and pattern design. I have a new camera, so it's taking me a bit longer than usual. Also, Barb made a souvenir pincushion of our trip. 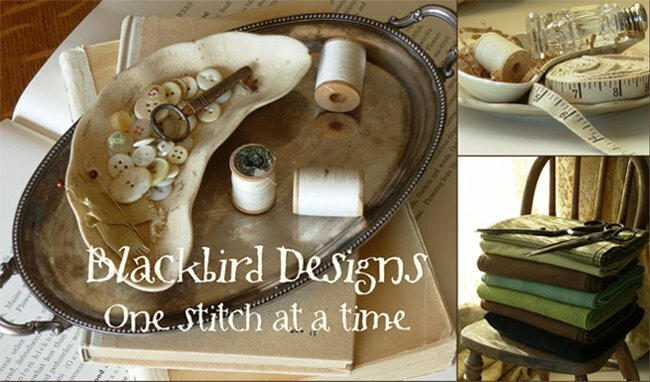 The picture of it is below....Barb wants to give you the pattern on the blog site. (Now I know you will like her better than me!!!) She gives the best presents! After Alissa completes the chart I will post it for you to download. I asked Barb...."Where's mine?" I might have to make this myself. It's just too cute. purchased the frame and will ship it off to Laura this week. Until later friends...hope you find a minute to stitch! I noticed no mention of you and Barb on all the quilting blogs so I figured you must not have gone. How strange not to have you there! I'd love to go to a quilt market someday -- or a cross stitch market! I love your sampler from France -- it's gorgeous! What threads did you use for it? I love that red! And thank Barb for the Paris freebie. I can't wait till you post it! BTW, I like you and Barb equally. :D You're both wonderful and talented! Will love the Paris pin cushion!! Paris is one of my wishes one day!!! Love the sampler chart but have not had time to do it yet but I will!!! I too admire you both equally!!! Will there be new fabric and a book/or or patterns? We always love getting your fabric in the shop. I adore your sampler & Barb's souvenir pincushion. They are both lovely! What an adorable pincushion! I also love the sampler from France! Such a pretty souvenir pincushion. I look forward to stitching it, and how wonderful you are going to offer the pattern! I love your beautiful sampler! Love the pincushion, can hardly wait for the pattern. The souvenir pincushion is so cute. I'll actually in in Paris for a few days in a little over 2 weeks (my first trip overseas)... I will have to stitch it for a memory piece for my upcoming trip. I like the pincushion, too and I'm waiting for the pattern, too! Love the pincushion, just adorable! I LOVE that color red. the basket from what I can see there is just beautiful. sorry you missed market always loved seeing your booth pictures! i love the tour eiffel tower and I'll behappy to stitch it. Thank you in adavnce for sharing your "treasures"
I can't wait for the posting of the Paris pattern - such a lovely souvenir! Thank you to you and Barb and also to Alissa for her charting of the same. 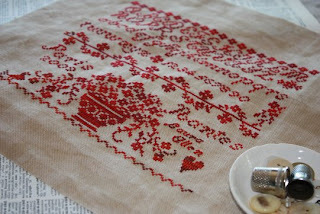 I adore your red sampler which means I now have to find this pattern too! That sampler you've stitched is beautiful! 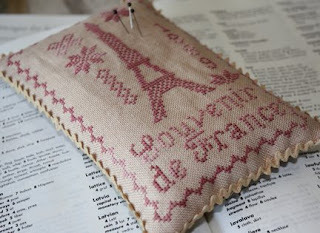 And I love the Paris design too, having been there myself this year it would be a wonderful memento to stitch. Love the sampler from France.I like that you took your french sampler back to France to work on. I've visited Paris twice and both times stood underneath the Eiffel Tower! The last time I was on a textile study tour with 23 other women. 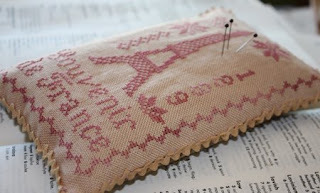 I can't wait to stitch the pincushion as my remembrance of the trip. You ladies are wonderful! Thanks.